Driving with only one headlight illuminated is both dangerous and against the law. 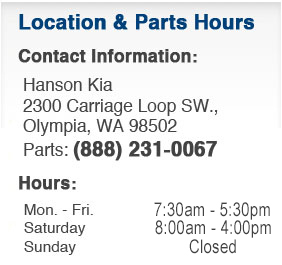 Avoid lots of potential problems by heading in to Hanson Kia for a genuine Kia headlight lamp replacement! Our bulbs are genuine Kia headlight bulbs, so you can be sure you're getting a perfect fit and excellent quality. Don't let reduced visibility put your life in danger; as soon as you notice a burned-out headlight, head to Hanson Kia. Your safety is well worth a drive from Tacoma or Puyallup--and avoiding a ticket is an extra bonus!